Due to the increasing trend and need of staying fit, more and more people have started using the gym equipment. While some of you go to the gym to workout, the others just buy the fitness equipment to workout at home. But once your machines arrive at your place, what are you going to do next? Do you just start using it without getting the complete information? No, this is not the actual way to do this. When you go to a gym for your workout session, you get a professional that gives you the instructions in the best possible manner. But when you plan to workout at home, you need to go through a series of instructions before you begin your workout session. You should know how to use the fitness equipment correctly and get the most out of your workout session. Here are a few tips that you should follow in order to have a well-informed workout session at home. One of the most common fitness equipment that are used by a majority of people is the cardio machine. It burns excess fat and also builds a good cardiovascular health. Not only it strengthens your heart and lungs but also reduces your chances from suffering high blood pressure and heart diseases. The cardio machine is suitable for any age or fitness level. Set your personal details like gender, age and weight in the console and save as your user profile. Then the console can estimate your target heart rate with the personal details that you enter. The treadmill can then get you in your fat burning zone when you workout. With the given details, the treadmill can also calculate how many calories you burnt during the workout session. Start warming up. No matter what type of exercises you do, warming up is essentially important to prevent unwanted injuries. To warm up, you just need to preset the console. The warmup session lasts up for 4-6 minutes where the treadmill is kept low in incline as well as speed for muscles to warm up. Keep your head straight, shoulders back and arms swinging. Make sure that your feet strike the conveyer belt directly below your knee. Monitor your heart rate. Wear a wireless chest strap that will send the information of the heart rate to the treadmill instantly. This allows you to stop if your heart rate goes to high. Do not hold the straps of the treadmill while walking or running as it can increase the risk of muscle strain and can also affect your body posture. Do not stop the treadmill at once. Gradually slow the speed down. Since there is no outside air to cool your body, thus, you should drink more fluids while being on the treadmill. Save your workout results to compare them from time to time. The Stationary Bikes are that fitness equipment that lets you the cycling while being at the constant place. Although it is quite easy, it also requires minimal training. The stationary bikes are great for shaping your thighs. They also give your thighs a break while giving you a remarkable workout session. 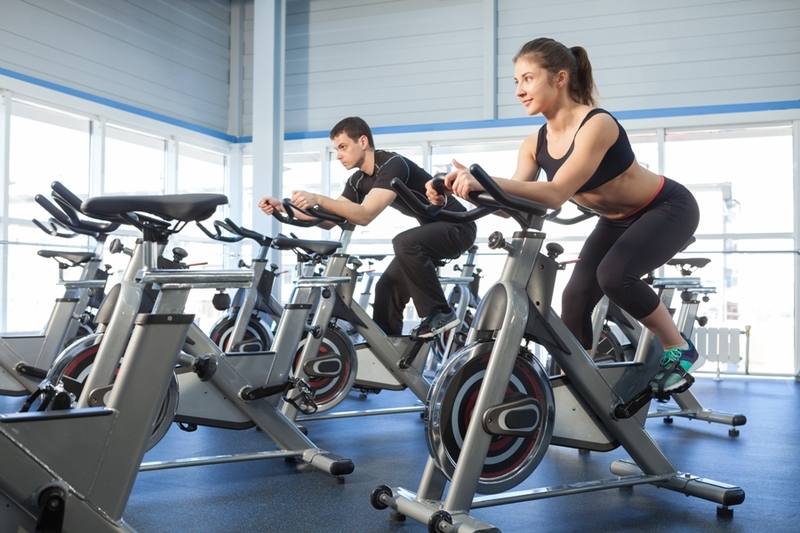 The stationary bikes also improve the cardiovascular health and strengthen your muscles. At the same time, they also provide less impact on your joints. Adjust your seat to a comfortable height so that your feet touch the pedals properly. If your pedal is at the lowest point, your knees should be slightly bent. Set the handlebars correctly. You should be able to hold the bars so that your arms extend out to the shoulder level. You should hold the handlebars in such a way to grip without leaning forward and bending your elbows only slightly. Adjust the pedal strap so that you can comfortably push the pedal up and down. Also, you should know that riding a stationary bike with pedal strap is much more comfortable and efficient than riding without it. Start with a warm-up session and then increase your movements after every few minutes. Do not pedal with your toes because if you do so, you are going to get foot and calf cramps. Do not move your ankles while pedalling. Do not hunch over the stationary bike. This is only going to give you back and neck pain. Keep your chest up and shoulders back. Monitor your heart rate and gradually decrease your movement to slow down. A rowing machine is that fitness equipment which lets you workout in a similar way as that of rowing the boat in the water. Thus, it gives you a full body workout. It is one of the best muscles for weight loss, increasing stamina and building and toning the muscles. The rowing machine helps you in developing both your upper and lower body. It gets your heart pumping and lungs working. The workout with this machine is done in a seated position which further gives less impact on your joints. If it is your first row, then you should then you should set the resistance low and then slowly ramp it up. Strap your feet comfortably. Secure them with strap tights so that your feet doesn’t move. Bring your knees up and slide to the top of the machine. Grab the handle with the overhand grip but do not hold it too tightly. Keep your wrists flat. Pull the handle with you, when you slide to the end of the machine. Make sure that your legs are straight and knees should have a slight bend. Start from the Catch position, then move towards the Drive position and then finish. Do not lean too far at the finish position or too forward at the catch position. Do not jerk the handle back with your arms. Avoid putting too much pressure on the handle. Move your arms out followed by your upper body. Make sure that your back is straight with shoulders back and abs engaged. As you extend your arms, your upper body position will move from slightly angled back position to slightly angled forward position. When your arms extend and body moves forward, slide your body forward by bending your legs. When you reach the top of the machine, fully extend your arms and bend your legs. To move back to the finish position, push your feet in such a way that your legs get straighten, arms are still extended and body is slightly leaning forward. Pull the handle with you. Ensure that your arms are straight and back is firm. Also, make sure that your legs and knees are straight. When you continue to push through your legs, move your upper body to lean back. Your arms are the last part of your body to return to the finish position. Pull the handle and bend the arms. Do not grip the handle too hard as it can cause hand blisters as well as back pain.